Clipping dog nails is an important part of your Schnauzer's health care. Unfortunately though, it is also one of the most neglected. Why? Because most dogs resist the process and most owners hate doing it. The 2 main reasons owners hate doing it is because they are frightened of cutting the nail quick which causes the dog pain and bleeding and/or because of the struggle and fuss the dog puts up trying to avoid having it done. (See How to Restrain a Dog). But if you begin a regular grooming schedule, your Schnauzer will learn to accept the process and actually become to enjoy it! In the wild, canines naturally wear down their nails by digging, climbing, gripping, and by traveling on foot for miles at a time encountering many different types of surfaces and terrain. But our indoor pets need a little help to keep their nails short and well-maintained. So begin grooming your Miniature Schnauzer right away. As with training, your Miniature Schnauzer will learn to accept the grooming process and actually come to enjoy it! Start by gathering up all the supplies you'll need: Nail clippers and/or grinding tool, styptic powder, nail file, scissors, and dog first aid kit. Before clipping, do a thorough inspection of your dogs nails and paw pads. 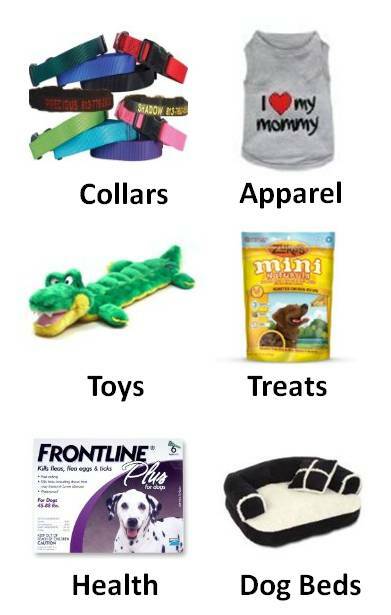 This helps to calm your dog and allows you the opportunity to thoroughly examine them for any damage. note: There's no rule that says you have to do everything at once. If your Schnauzer start to squirm, speak soft praises and then offer him up a treat after the inspection and stop the session at this time. 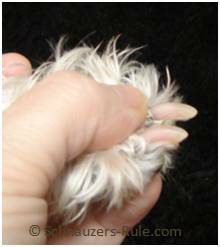 Repeat this process daily until your Schnauzer is comfortable with you examining his paws. With the scissors, trim the fur from in between the pads under each paw. You can use your grooming clippers or a pair of scissors to do this. Choose the type of clipping tool you prefer: regular guillotine style trimmer or a cordless rotary filer or dog nail grinder. It's important that you remain calm during the process. Your Schnauzer will be able to sense if you begin to tense up or feel uncertain. Don't try to cut off too much. You risk cutting the quick causing your dog to bleed. And he will NEVER FOR GET IT! Making future sessions that more difficult. It is best to cut off very little each time. This makes the whole trimming process a breeze for both of you. STOP! You Reached the Quick! 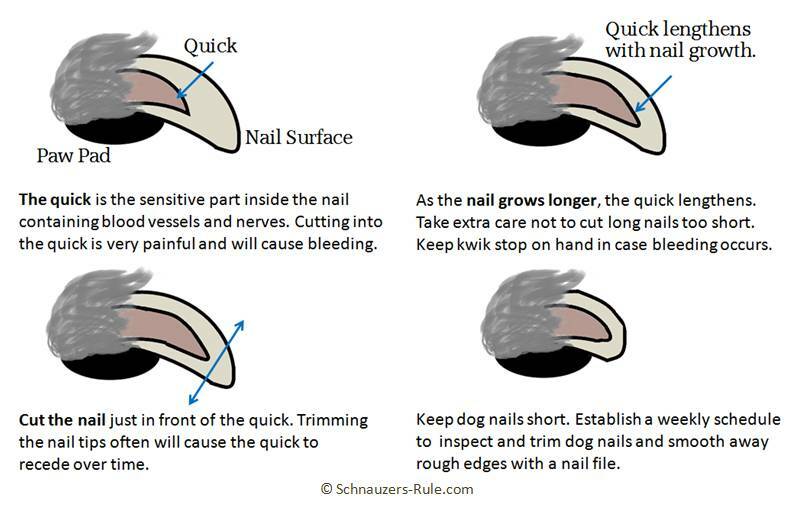 Dog nails have a hard outer covering and soft inner part called the quick. The quick is the living part of the nail that contains blood vessels and nerve endings. So always stop cutting as soon as you see a little dark circle appear in the center of the nail. If you do cut the quick and bleeding occurs, use the styptic powder to stop the bleeding. Continue trimming each nail from the front paws and then begin on the back paws. When you are finished clipping, use a nail file, sand paper or dremel to file off and smooth down any rough edges. Lastly, take some paw pad moisturizer or a tiny bit of vaseline and rub it on each pad. Your Schnauzer should enjoy the massage and will be the last thing he remembers about having his nails trimmed. When you are completely through, praise your Schnauzer and give him a treat for being such a good boy. Trimming your dogs nail weekly is the easiest way to maintain the perfect length and keep the quick from growing out too long. With a bit of practice, you will learn to trim your Miniature Schnauzer's nails with complete confidence. dog grooming tip: Many vet offices will trim dog nails, if you ask them. So on your next visit be sure to ask your Vet: "Can you trim my Miniature Schnauzer's nails?" Then you can watch how they do it. Have your dog lie on a table and position yourself on the opposite side. Drape your arms and upper body over your dog (ie lean into the dog as in photo). Use the arm not holding the clipping tool to keep your dog still and lying on his side by resting your elbow on the table and applying a light pressure up under the head and neck region. You are still able to use this hand to lift and hold your dog's paw. 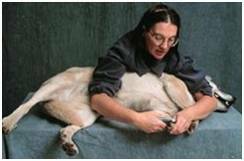 Use your other arm, also draped around the dog's lower part of the body to keep it still, to clip the nails. When needed, you may apply light pressure with your body weight to secure a dog that tries to resist. • Always push the paw hair as far back away from the nails so the rotary does not grab it while spinning. • Also, be aware that battery operated or electric tools do become hot when in use, so be sure and check for a comfortable temperature often. After filing a few nails, check to see if the tool has become too hot. If it has, take a break and resume filing once it has cooled. "Knowledge Share"... If you found this article of How to Clip Dog Nails helpful and informative, please share it with your dog-loving friends by clicking on one of the share links (like facebook, twitter, and google +1) located at the top right or bottom of this page. Do You Trim Your Schnauzer's Nails?